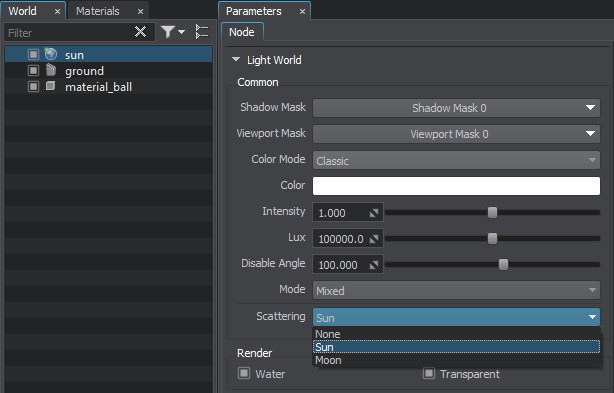 The built-in WorldLight dynamic environment cubemap automatically generates lighting and reflections for all objects in the scene. The result depends on the position of the Sun and Moon. It acts similarly to the infinitely large environment probe, but works faster and doesn't require placing any additional object in the scene. If you need to change reflections locally, for example indoors, use the environment probe with the unique cubemap. There is also a Disable angle setting for the WorldLight defining a critical angle above the horizon, where the light source is still enabled.